We're all seeking comfort when it comes to dressing up, and this combination of a Polo Ralph Lauren stripe pocket t shirt from MATCHESFASHION.COM and charcoal shorts is a practical illustration of that. When it comes to footwear, this outfit pairs brilliantly with white low top sneakers. If you're scouting for a casual yet stylish getup, pair a Polo Ralph Lauren stripe pocket t shirt with khaki chinos. Both pieces are totally comfortable and will look great together. 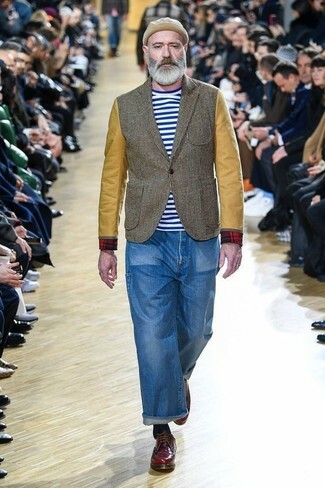 When it comes to shoes, this look is round off nicely with white low top sneakers. If you're on the lookout for a casual yet on-trend outfit, try pairing a white and blue horizontal striped crew-neck t-shirt with navy chinos. Both garments are totally comfortable and will look great together. If you're hunting for a casual yet on-trend getup, consider pairing a Polo Ralph Lauren stripe pocket t shirt with pink chinos. Both items are totally comfortable and will look great paired together. When it comes to footwear, this ensemble is complemented nicely with blue low top sneakers. 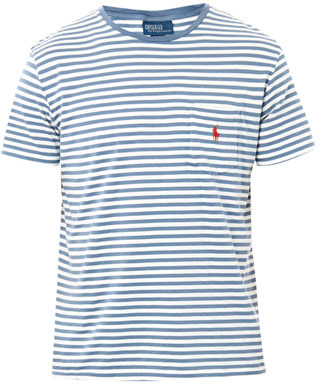 Make a Polo Ralph Lauren stripe pocket t shirt from MATCHESFASHION.COM and blue jeans your outfit choice, if you feel like relaxed dressing without looking like you don't care. Charcoal plimsolls will bring a classic aesthetic to the getup. 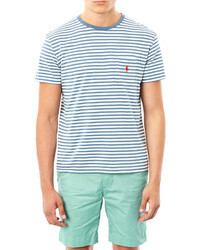 Make a Polo Ralph Lauren stripe pocket t shirt from MATCHESFASHION.COM and blue jeans your outfit choice for a laid-back yet fashion-forward outfit. Elevate this look with burgundy leather derby shoes. 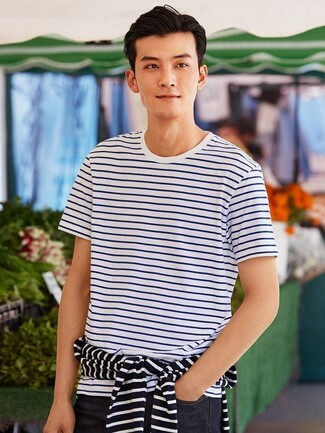 If you're all about comfort dressing when it comes to fashion, you'll love this easy combo of a white and blue horizontal striped crew-neck t-shirt and navy jeans. 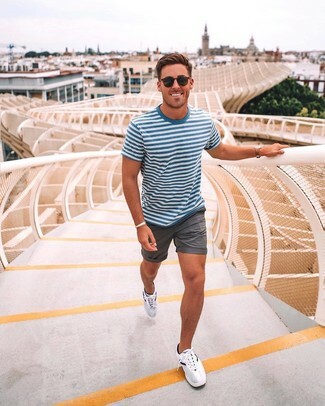 If you're after a casual and at the same time sharp outfit, marry a Polo Ralph Lauren white and blue horizontal striped crew-neck t-shirt with grey shorts. Feeling transgressive today? Switch things up with white athletic shoes.